The latest classic Performancing theme for WordPress, Redbook represents balance, structure and symmetry. Created in collaboration with Brian Gardner, Redbook lives up to its name by incorporating what we think to be salient aspects of a physical book with the modern feel of a sophisticated website (hence “red book”). Viewing a blog powered by the Redbook WordPress theme, one would feel as if unfolding an actual hard-bound book, with the left and right sidebars “folding” out, and red and grey liners reminiscent of a book’s cover and leaves. 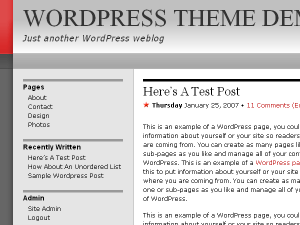 Redbook is a three-column theme with a sidebar on each side. The main column is mainly white-on-black, which is excellent for readability and adds to that book-like feel. The presentation of the sidebars is organized, with dark grey lines that separate each major heading. This theme is ideal for professional or personal bloggers who wish to convey a sense of organization and structure. Update: Redbook has been updated for compatibility with WordPress 2.7 and up. Download the latest version here.